The primary division of ore type is between bedded ores and secondary ores. Bedded ores occur within the geological sequence and are mined either by quarries, drift or shafts. 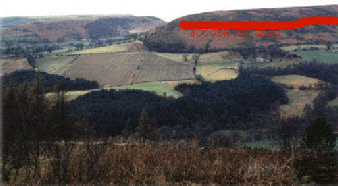 These deposits occur in the the area regarded as the principal iron production regions in Britain, e.g. The Weald of Sussex and Kent, the Jurassic ridge running through Lincolnshire and Northamptonshire, the central belt of Scotland. The secondary iron ore is commonly termed ‘bog ore’. Groundwater percolates through iron bearing rocks including e.g. chalk containing iron pyrite nodules, taking the iron into solution, which is re-deposited as the water emerges in valley bottoms etc. It may also form as ‘iron pan’ e.g. At the interface of clay and peat deposits. Hematites Fe2O3 e.g. Cumbria, but also found at the Saxon site of West Heslerton, East Yorkshire presumably as glacial erratics. Hydroxides FeOOH, the chemical form present in bog ores.